This lovely two bedroom, villa standing in its own gated grounds and nestling in the hillside just a few hundred metres below the centre village of Sarlata is ideally located for touring this beautiful island and beaches. 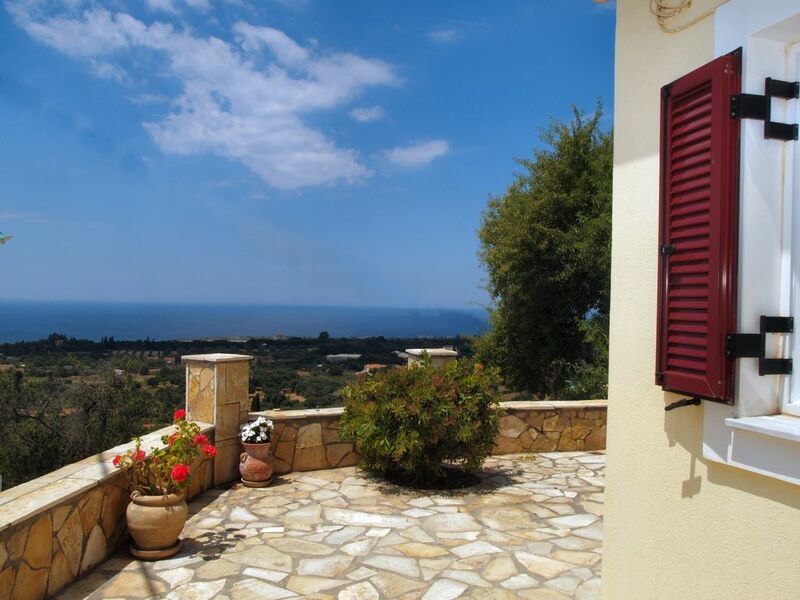 The south facing villa enjoys magnificent panoramic views, past ancient ruins, through the valley down to the sea. The accommodation consists of 1 double bedroom and 1 twin bedroom both with fitted wardrobes. The living area is open plan having a fully fitted kitchen (4 ring hob, built in oven, fridge freezer, dishwasher, microwave, etc.) and a lounge/dining area with real open fireplace. The bathroom is spacious, luxuriously tiled, and contains a large walk in shower, WC and basin. The villa is air conditioned and has a fully automatic washing machine in the outhouse and free wi-fi. The generous terrace at the rear of the villa offers the ability to enjoy all meals alfresco whilst marvelling at the magnificent view. There is also secure off-road parking for a car and or a motorbike. Sarlata is only a 10 minute drive from the capital Argostoli and the busy resort of Lassi. A variety of lovely sandy beaches and the airport are 10 to 15 mins away. The fortress of Saint George, the old capital of Kefalonia is close by and has spectacular views and a great cafe. Lakithra the next village (1 Km) has a supermarket, bakery, cake shop, pizza/Greek restaurant, cafe and a couple of bars. Also the Mouikis Village in Lakithra offers a swimming pool, tennis courts & a bar for public use. See schedule below for availability and price. We have been coming to Kefalonia for 20 years. We loved the island so much that we decided to build a home and have had many years of enjoyment using it. Lovely villa, lovely views, well equipped but limited WiF & difficult to access with a car due to very narrow lane. However, would recommend this villa. Just returned from 2 weeks at Villa Cephie. We have visited Kefalonia since 1993 and this was by far the most relaxing location. Villa Cephie is in an elevated position with breathtaking view of Svoranata and the sea, surrounded by very few properties so no road noise. You are well positioned to tour the island. The villa itself is tastefully furnished with good quality bedding and towels. On arrival it was spotlessly clean - thanks to Nigel and Jackie who manage the villa, they also met us at the airport on arrival to show us to the villa, this was much appreciated. The kitchen has all the equipment you could need, with a good oven and hob, fridge/ freezer and a brand new dishwasher. Washing machine was also a bonus, didn't bring home much washing as the weather was perfect. Car hire is essential, we recommend hiring the smallest possible for your needs, as the approach road is quite narrow, it didn't cause us a problem as our hire car was very small!. Thank you Linsey for sharing your home with us. Would we return, yes definitely. We had a great week at Villa Cephie. The villa itself was very clean and spacious, with everything we needed. There's plenty of space outside with great sea views. Inside and out was very nicely furnished. There's several beaches within a ten minute drive (and others further afield) and you're not far from other attractions (St George's Castle, Argostoli, and the Gentilini Winery spring to mind). There's three good sized supermarkets ten minutes away too, plus local shops dotted around. There isn't a lot within walking distance, so a car is pretty much essential. Lynsey was really helpful and quick to respond to our queries before we arrived. We just came back from Kefalonia and I am just writing to tell you how much we enjoyed your place. It is so friendly and cosy that it was a great pleasure being there. All the best, and I wish you, your husband and your family to continue enjoying the place as much as we did (and even more) for many years to come. Villa Cephie proved to be perfect our holiday this year. Having now travelled to Kefalonia on eight occasions and now finding this Villa, we will definitely look forward to returning here in the future. The Villa was very comfortable, had beautiful views, very quiet and peaceful and certainly a place to chill and relax. For most of the time, there was a lovely breeze which helped on the very hot days. The description of this property is spot on and could not be closer to the truth. Situated in Sarlata, a tranquil location in a traditional Greek village with un-interrupted views overlooking the olive groves and pine trees down towards the beautiful beaches of Avithos and Ai Helios both no more than a 10 minutes drive. From the lounge, double bedroom and the terrace, the wonderful views can be enjoyed. The kitchen was well set out and equipped with washing machine (tucked away in a utility room). Everything seems to have been catered for to ensure that guests enjoy their stay.The twin room is situation at the rear of the property and is a great second bedroom. The bathroom has a large spacious walk in shower with constant hot water. A TV and surround system are provided, this is mainly for watching DVDs and listening to music. You can relax with the beautiful view on the terrace on the comfy sunbeds. We certainly took full advantage of enjoying the Villa during the day as we were in need of a complete relaxing and chilled break. In addition, if you prefer to use a swimming pool from time to time, hotels in the area welcome you to use their facilities. We had quite a number of leisurely evenings using the gas BBQ provided and certainly enjoyed shopping at the meat market near the castle where the quality of the meat was excellent with a wonderful choice. The fruit market and bakery in Argostoli provide a great selection of fresh produce. This Villa is in a perfect position with easy reach of the capital Argostoli and access roads to explore the wonderful island. There are many local beaches of which Avithos and St Thomas (especially good for swimming and snorkelling) are two of our favourites. Many of which have small beach bars or alternatively an amazing sunset can be found on the terrace of the Villa. There is a huge selection of locally family run restaurants in the area. Steve and Lynsey, we thoroughly enjoyed our holiday – thank you. You have such a lovely Villa. We stayed at Villa Cephie for a week and used it as our base to tour the island. The villa itself is comfortable, clean and tidy. The details and photos describing the property give an accurate impression of the villa. The owners organised everything very well, we were met on arrival at the villa and shown how everything works. Mid week somebody passed to change the bed sheets and give us some new towels. The villa is located on a quiet hill side and the view from the terrace is marvellous. A lovely place to eat dinner or relax with a book. Its ten minutes drive to the airport and the islands capital Argostoli is also conveniently close, about ten miles away. There are several beautiful beaches to choose from if you like to swim. The sea is a few minutes away by car and parking is no problem at all. The area is quite well populated so there are plenty of Greek taverns to choose from. If you want to find a really Greek tavern, try Anna's taverna at Keramies. Ten minutes drive away you will find the 15th century castle of king George. The views from the castle are spectacular and there are several tavernas up on top of the hill near the castle gates. All in all, we were very happy with our choice of Villa Cephie and would not hesitate to book it again if or when we return to the lovely island of Cephelonia. A £200 non refundable deposit is required on booking. Balance due 8 weeks before commencement of rental.